CMP slip-on Earth Tags, installed between the Cable Gland and equipment, provide an earth bond connection as specified in BS6121:Part 5:1993 and comply with category B rating specified in IEC 62444. CMP Earth Tags have been independently short circuit tested to verify their suitability under specified service conditions. A copy of the test report is available upon request and is an important factor when selecting earth tags from any manufacturer, as without this the safety of installations may be compromised. Stainless steel, aluminium and nickel plated brass earth tags are also available. Please refer to , e.g. 20ET4 for M20 Stainless Steel Earth Tag, 050NPTET4 for 1/2” NPT Stainless Steel Earth Tag. Metric Ordering Reference (Brass) Reference Diameter ?"A?" Minimum Thickness Nominal Diameter ?"C?" Hole Size ?"D?" Nominal Length ?"E?" Nominal Centres "?F?" NPT Ordering Reference (Brass) Reference Diameter ?"A?" Minimum Thickness Nominal Diameter ?"C?" Hole Size ?"D"? Nominal Length "?E" Nominal Centres ?"F"? 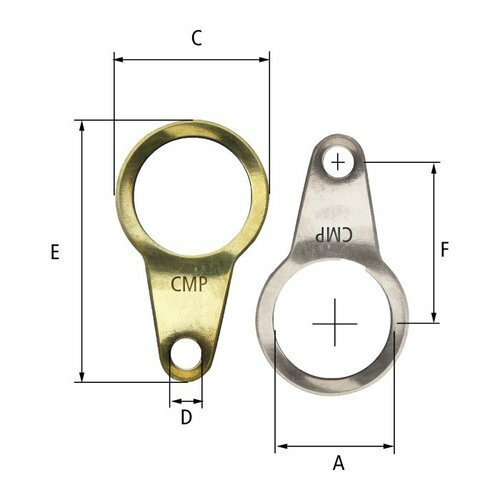 Metric Ordering Reference (Brass) Reference Diameter "?A?" Minimum Thickness Nominal Diameter ?"C?" Hole Size ?"D?" Nominal Length ?"E"? Nominal Centres ?"F"? NPT Ordering Reference (Brass) Reference Diameter ?"A?" Minimum Thickness Nominal Diameter ?"C?" Hole Size "?D"? Nominal Length ? "E" Nominal Centres ? "F"?